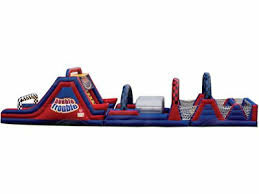 Our Double Trouble Obstacle Course is over 75 feet long and full of inflatable fun and challenges. Two contestants line up at the entrance, then race each other thru the entry chute, over the log jamb, up the first small inflatable rock wall then up the second and larger rock wall, and finally slide down the giant inflatable slide. Double Trouble is the ultimate inflatable obstacle course for any special event or kids party .... it's exhausting, yet exhilarating and most definitely FUN. Our Double Trouble obstacle course is a “must have” and always the “crowd favorite” at school functions, church fairs, corporate events, town festivals or any other well attended function where kids are present.